Tour the fifth largest forest in the US on this Hummer H1 morning or afternoon adventure! Tonto National Forest in Arizona boasts nearly 3 million acres (1.2 million hectares) of beautiful rugged country. Explore the desert terrain, mountain landscapes and sprawling trees on this unforgettable Hummer adventure. Experience the beauty of Arizona on this thrilling Hummer H1 adventure through the Tonto National Forest! Tour the expansive terrain in a powerful Hummer that will claw its way through the most rugged trails. See desert critters and unique wildlife as well as the impressive Four Peaks Mountain, named for the distinctive four peaks on the North-South ridge. In the distance, admire the Superstition Mountains -- the hidden location of the 'Lost Dutchman's Gold Mine.' 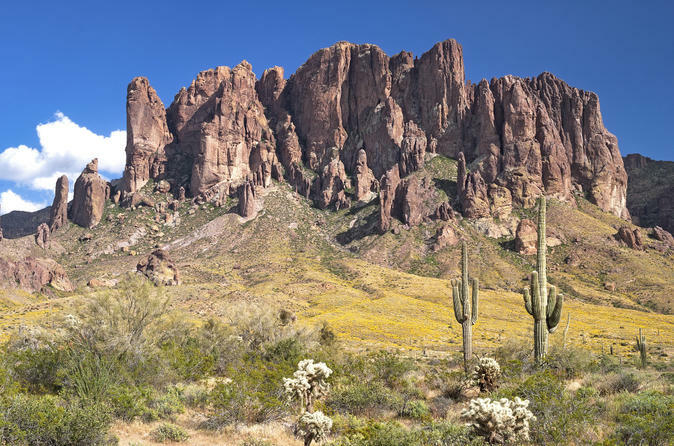 Spot Weaver’s Needle, the 1,000-foot (300-meter) rock formation jutting into the sky, whose shadow supposedly indicates the entrance to this mysterious mine. If you’re looking for more action, upgrade to the extreme tour to venture through rocks, dips, ravines and more!